Happy holidays! I’ve put together a few items to help point friends & family toward desirable gifts for fellow coffee geeks, and to help guide you folks arriving here via Google find something that will delight the coffee lover in your life. 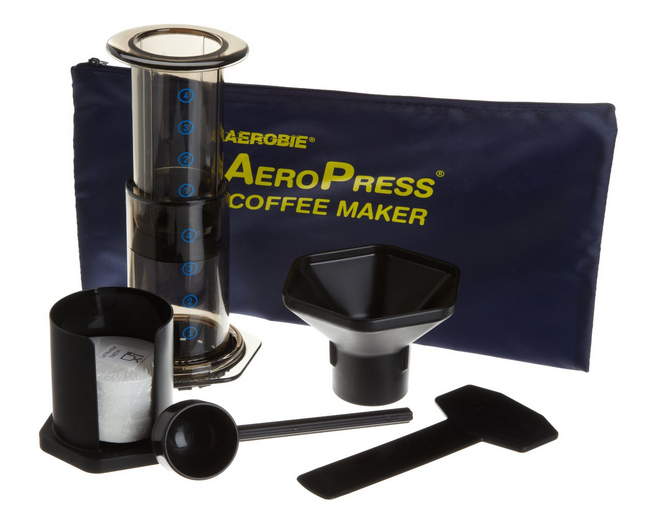 Aerobie Aeropress $26 - perhaps the perfect single cup coffee brewer. Flexibility to use with a multitude of techniques, and easily portable for travel or office use, this is a must-have for every coffee lover’s arsenal. 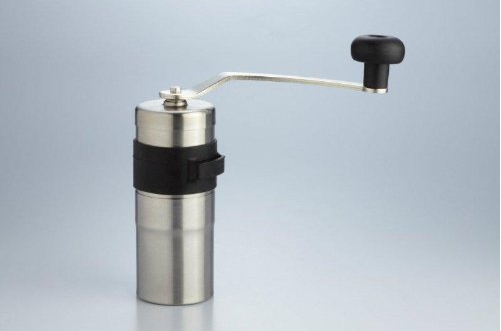 Porlex Mini Grinder $42 – I have the Hario Slim (which can grind more beans at one time), but I hear many good things about this mini Porlex grinder – I include it here because it has the distinction of being able to fit inside the Aeropress, creating a killer self-contained combo for travel. Also, it’s much cheaper this year than it has been for a while – last year they were $60-70 most places! 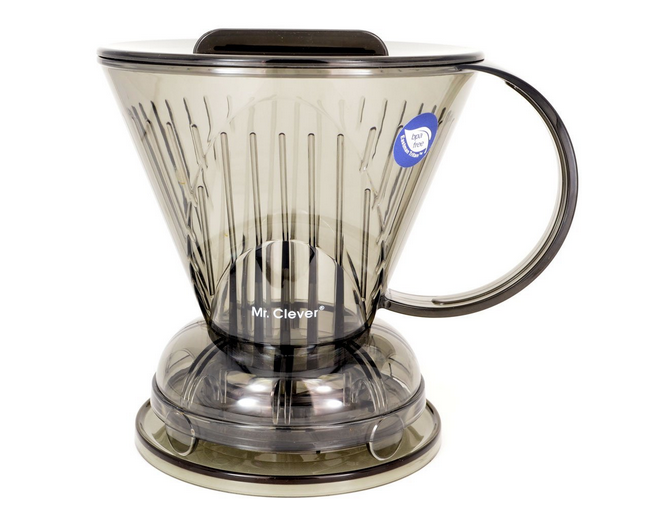 Clever Coffee Dripper $21 – The Clever combines the design of a pourover with the ability to control steeping time. It may be one of the easiest low-budget, office-friendly methods to make a few cups of coffee without having to use a dedicated pouring kettle. Bonavita also has a ceramic version at a higher price point. 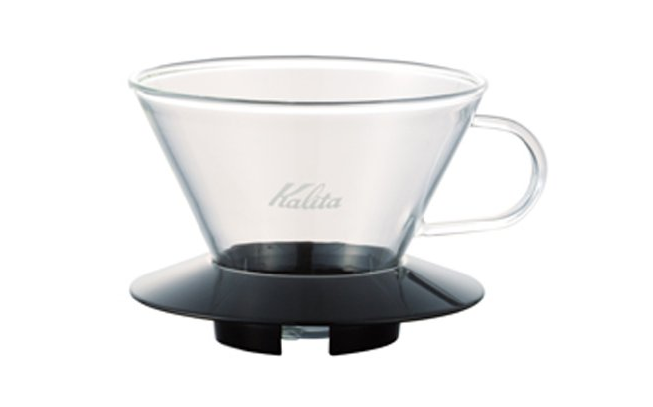 Kalita Wave Glass Dripper $29 – Currently on trend, whereas wedge and cone style drippers were mainstays until recently, flat-bottomed brewers like these have regained favor with claims that they offer more even extraction. I personally find it requires a lot less finesse to get a good brew with brewers that use these cupcake style filters. Best for serving 2-4 people. notNeutral GINO dripper $24 – Similar to the Kalita Wave, the GINO uses flat bottom filters, but adds insulated double-walled glass and a slightly slower flow rate. You can also buy the dripper with matching LINO mugs as a set for $54. 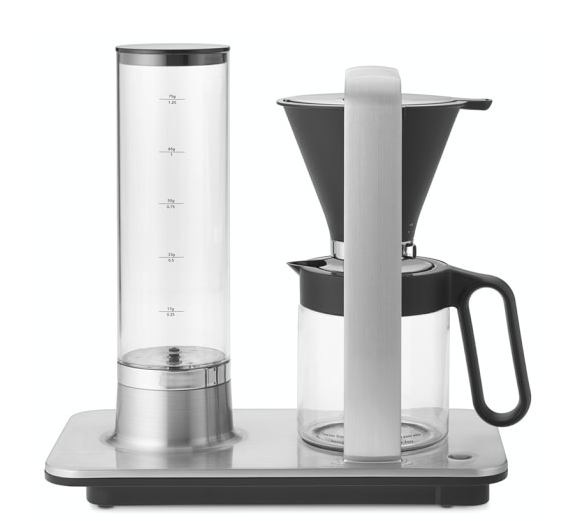 notNeutral GINO server $38 – complete the set with this matching server – because you’ll want to brew more than one cup at a time with this style of brewer. Plus it looks beautiful. Shown above next to a ModBar pour over unit. Hario Coffee Scale with Timer $40 - the easiest way to get better coffee, aside from investing in a quality grinder, is to start weighing your beans, water, and brewing time. 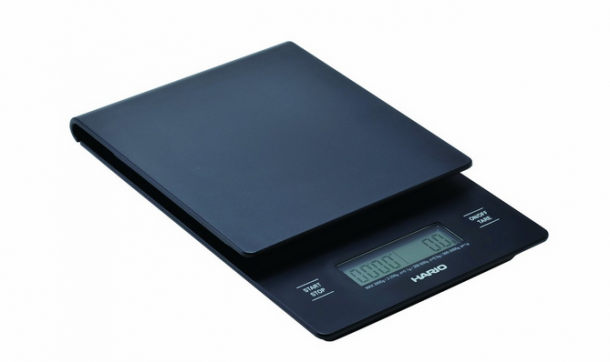 This scale from Hario does all that – it includes a timer that keeps the scale from turning off while brewing. 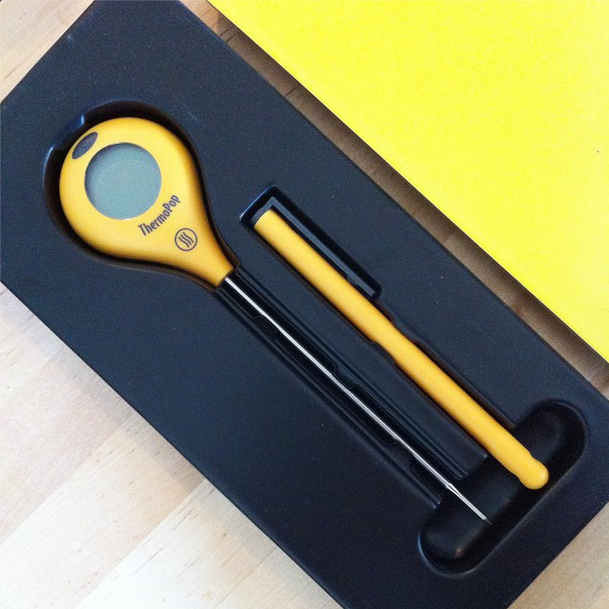 ThermoWorks ThermoPop thermometer $29 – I picked up one of these last summer when my old thermometer died, and I really like it. It reads fast and the digital display rotates if you press a button on the back, making it easy to check your water temperature. The only gripe I have is that the button placement isn’t really ergonomic, but that’s a small complaint – overall I love it! 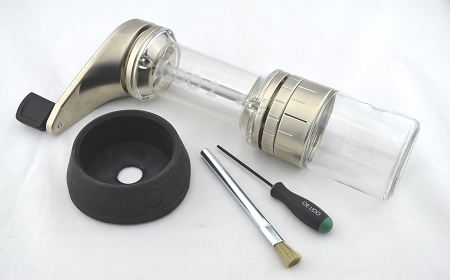 Cold Bruer $75 – (Take 10% off with code: frshgrnd-bruer) This attractively made cold brewer has an adjustable valve that allows you to set the drip rate, offering some control over the speed of extraction. 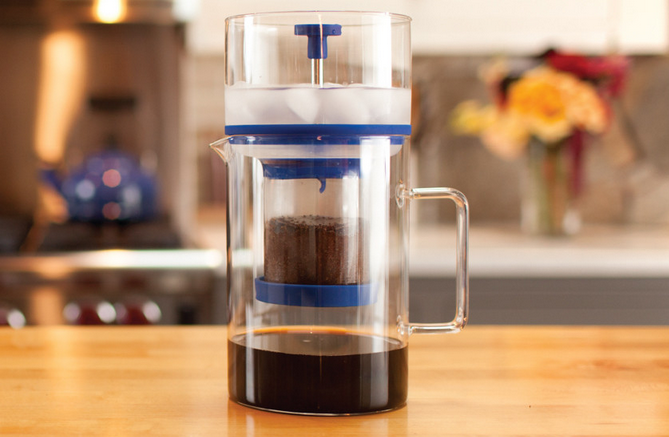 I found it easy to set up and thoughtfully designed, and a lot more affordable than other slow-drip cold brewers! Stay tuned for a review. 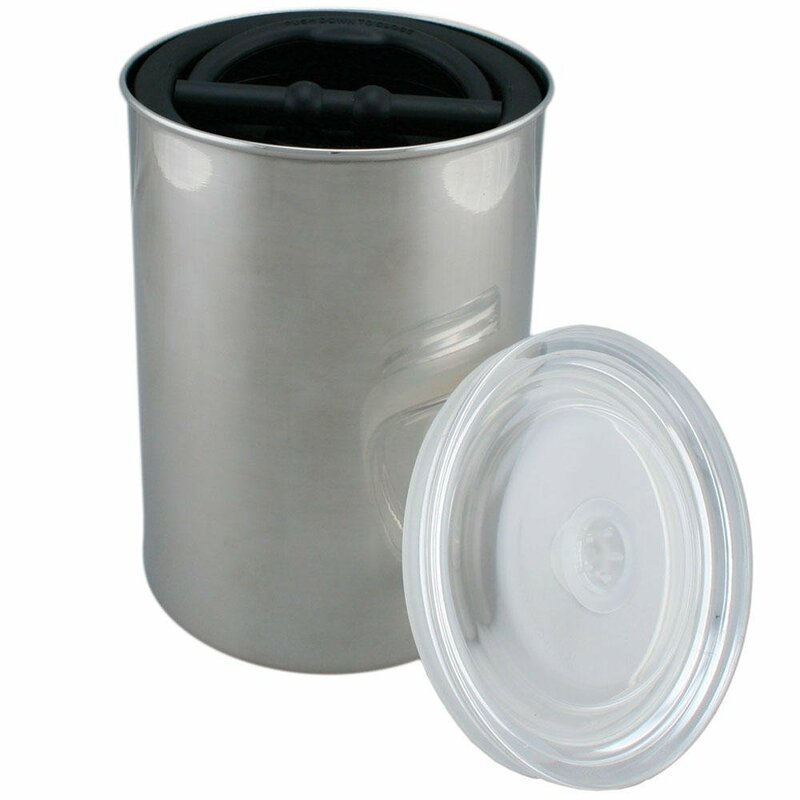 Planetary Design Airscape Canister $25 – Keep your beans fresher longer. Definitely worth it when you’re spending a premium on high quality beans. 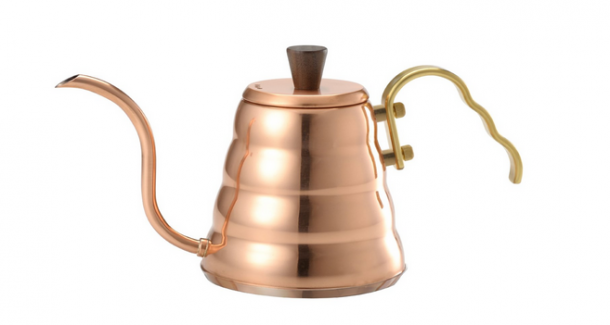 Hario Buono Copper Pouring Kettle $116 – More bling than bang-for-your-buck, there are cheaper kettles out there (check out the FRSHGRND Amazon store’s kettle section), but this is a piece of eye candy that even the coffee geek who has everything will probably not have in their repertoire. Coil $199 – Still in Kickstarter mode, this is a gift for the patient early-adopter on your list. The coil’s namesake copper tubing sends your hot coffee through an ice water bath that drops its temperature to 48˚ – promising to end the dilution dilemma for those who want fresh, normally brewed, iced coffee. Blue Bottle Moka Pot $100 (pre-order online, but may be available in stores) – A collaboration with noted ceramic artist, Joey Roth, this is a bit of a curiosity. Moka pots aren’t known for their clean flavor profile or finesse, but they are a staple in many homes and are synonymous with ‘espresso’ at home for many mainstream coffee drinkers. I haven’t had a chance to try this myself so I can’t speak to its abilities, but I can see that it’s a piece of functional art that I’d love to play with – and I imagine many others would too. Worst case scenario, you’ll have something fun to brew up that stale can of Illy your well-meaning friends gifted you. 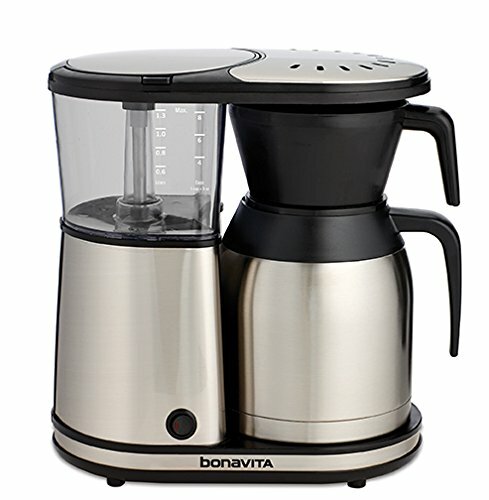 Bonavita BVT1900TS $179 – Bonavita is a brand that has made a name for itself by catering to coffee aficionados’ demands at an affordable price point. 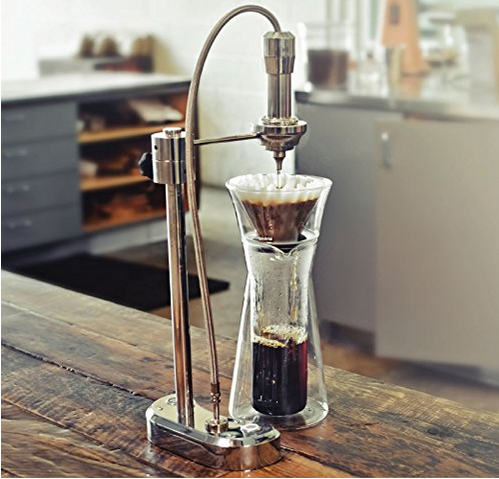 This latest SCAA-certified automatic drip brewer is a case in point, updating their popular design with a flat-bottomed filter, as well as a pre-infusion option to let fresh coffee bloom before the full brewing cycle. 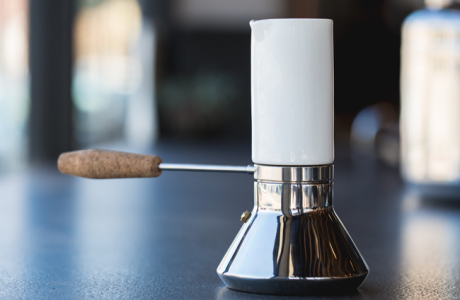 Orphan Espresso LIDO 2 hand grinder $175 – This hand grinder is a beast. Orphan Espresso has gained renown among home baristas for their enhanced grinders, designed to reliably grind fine enough for espresso. They do this by designing the grinder assembly with high end materials and additional supports to avoid the burr wobble and associated inconsistent particle size that you can get with cheaper models (like the Hario and Porlex mentioned above). This is on my personal wish list! Wilfa Precision Coffee Brewer $250-329 – Designed in conjunction with coffee luminary Tim Wendelboe of Norway, this one-of-a-kind coffee brewer looks amazing and adds unique features like a detachable water vessel, and a flow restricter to allow you to brew as much as 42oz, or as little as one cup at a time. 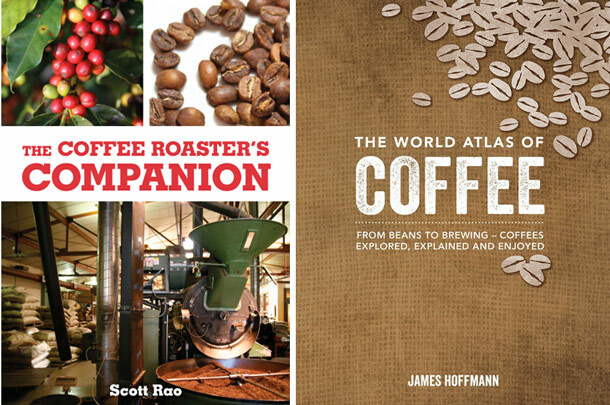 The two books to get this year are Scott Rao’s “The Coffee Roaster’s Companion” ($45), and James Hoffmann’s encyclopedic “World Atlas of Coffee” ($26). You can see my original post here. 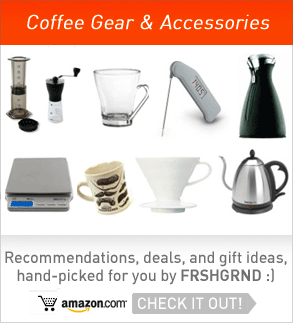 Spread the coffee cheer with some FRSHGRND gear! 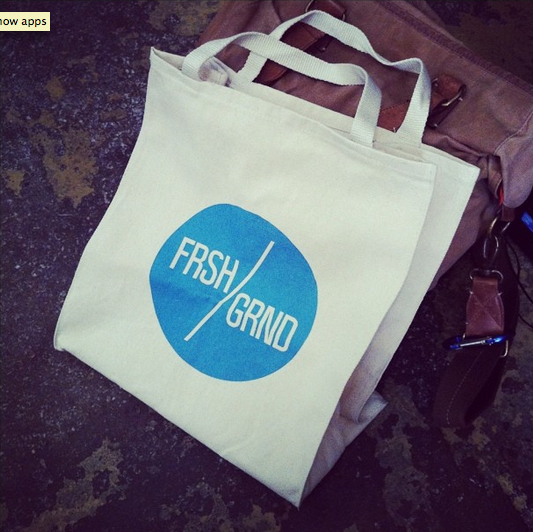 There’re a mix of stickers and tote bags available on the FRSHGRND Zazzle store (there’s also a one-day 20% off sale today, use code SIGNEDSEALED). Above you can see the one I bought for myself. 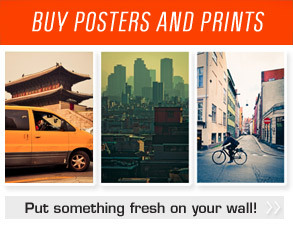 I also have a range of poster prints up for sale – for a limited time get $5 OFF and FREE INTERNATIONAL SHIPPING with THIS LINK. Most of these photos were taken while on the way to a cafe somewhere in the world, from Sweden to Korea and beyond. A few of my faves above, and if you have any favorites from old posts on the blog, let me know and I can upload them to the store in print size! 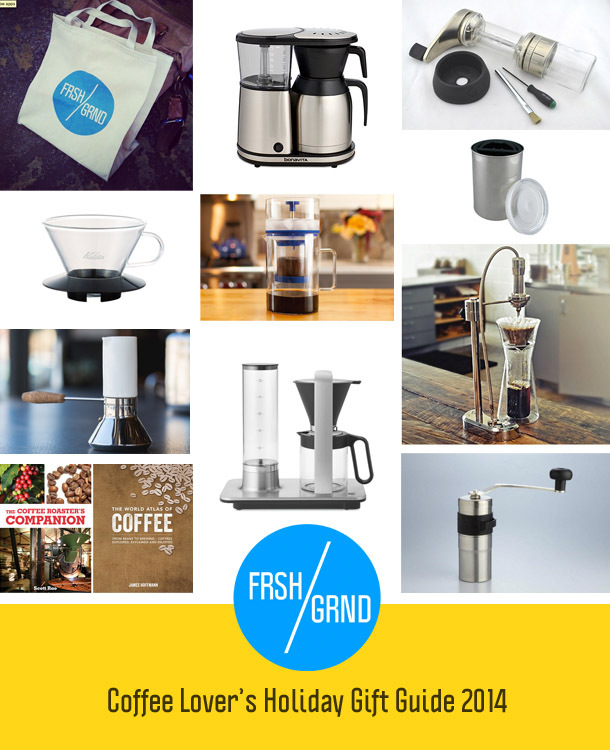 That’s all for this year, if you think I missed anything let me know in the comments – also, check out the last FRSHGRND holiday gift guide here or the FRSHGRD curated Amazon store for more ideas like fun mugs and more brewing accessories! OMG AARON, you have done it again! I’m on such a huge cold coffee kick.